Seton Hall University offers two off-campus apartment building options for upperclass students. Both buildings are staffed by our highly trained RAs and an RHD. The same on-campus residence hall policies apply but the apartment style living gives students more independence with being physically separated from campus. 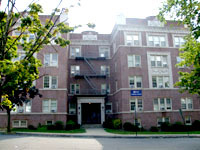 Ora Manor houses approximately 103 upperclassmen in newly renovated apartment-style housing that is owned and operated by Seton Hall University’s Housing & Residence Life. Ora Manor is about 2 miles from the South Orange campus. In the heart of South Orange Village, Ora Manor is within walking distance of grocery stores, banks, restaurants, pharmacies, the South Orange Train Station, and the South Orange Performing Arts Center and Clearview Cinemas among others. Parking Services runs a shuttle called SHUFLY which offers transportation to and from campus in addition to all of the above locations and the area mall. SHUFLY is free to all resident students. Apartments contain either one single bedroom and one double bedroom (3 person) OR one single bedroom and two double bedrooms (5 person). The 5 person option comes with an additional half bathroom. All apartments have WiFi access and cable TV. Kitchens are freshly renovated with beautiful counter tops and living room furniture is fairly new as well. Laundry machines are found in the Ora Manor basement. Turrell Manor is a unique living and learning community. It is home to 83 upperclass students who are committed to academic excellence and servant leadership as a means of building a vibrant community. The Turrell Manor experience is one that nurtures and aids students during their transition period from college into the world after graduation. This living experience provides a focus for out-of-class learning through programming that integrates intellectual stimulation, dedication to service, and social interaction in a community living environment. Apartment options in Turrell Manor include: 1 person single, 2 person with 2 single bedrooms, 2 person double, 4 person double-doubles. All windows and air conditioners are brand new and residents enjoy the convenience of an elevator and on-site mail delivery. Previous Previous post: Spend your Summer in Sunny South Orange – Summer Housing Applications Now Available!